Indigenous oil marketing company, Ghana Oil Company Limited (GOIL), has presented a sponsorship package of GH¢50,000 to the President Sports Writers Association of Ghana (SWAG) towards the smooth organisation of the 43rd edition of the prestigious SWAG Awards night at a colourful ceremony in Accra on Tuesday, 20th February 2018. Presenting the cheque for GH¢40,000 and fuel coupons valued GH¢10,000 to SWAG, the Chief Operating Officer of GOIL, Mr Alex Josiah Adzew said: “Over the last five years, GOIL has been assisting the Sports Writers Association of Ghana with financial and other support aimed at improving sports development and promotion. He noted that this has been one of the cardinal aims of GOIL’s corporate social responsibility and supporting SWAG awards night was in line with supporting local sportsmen and women who have distinguished themselves in the country. 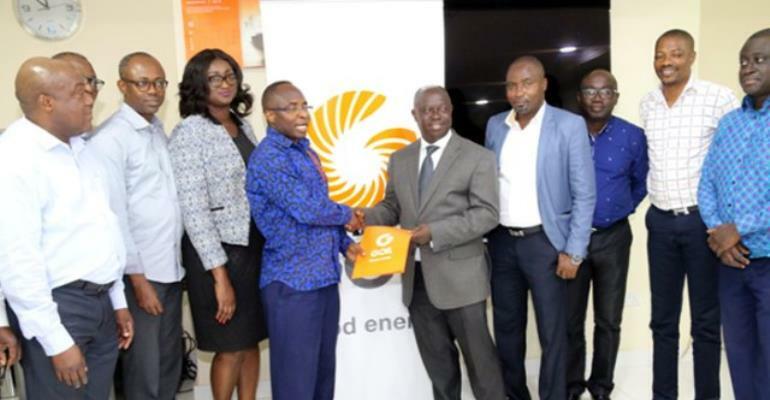 The President of SWAG, Mr Kwabena Yeboah, who received the cheque and the coupons on behalf of SWAG, highlighted GOIL’s continuous support to SWAG over the past five years. “GOIL has over the years made significant strides in transforming itself from a mere moribund state enterprise to become the No 1 Oil Marketing giant in the country. Your Good Energy and complete face-lifting and revamping of existing stations as well as a number of service stations, undoubtedly, make you the most attractive oil company in Ghana, the reason most Ghanaians now identify with GOIL. "The fact that Ghana’s most successful and iconic sporting hero, Prof. Barima Azuma Nelson chooses GOIL is a clear testament to your commitment to the needs of Ghanaians. It is for this reason that SWAG proudly associates with GOIL”, Mr Kwabena Yeboah said. The 43rd SWAG Awards, which will honour distinguished sportsmen and women, is scheduled to take place on 28th April 2018 at the Accra International Conference Centre.